Good nutrition is considered to be an important part of maintaining good health and leading a healthy lifestyle. Therefore, every day we have to make wise food choices for a balanced dietary regime. Even though it sounds like a piece of cake, choosing the right food product can sometimes be harder than it seems. Fortunately, food products contain labels which provide us with information about the products’ nutrients and recommended daily intake, so we won’t make a mistake and consume more or less vitamins, minerals, fat, proteins, sugars etc. than the dose we need. So, we often find ourselves among supermarket shelves reading labels and analyzing the info about different products, as if we are reading some book in order to write a review for a magazine. However, food labels contain only the basic information required by food laws. And unless you are a scientist and know the food discourse, you will come across a bunch of strange names for different types of additives, acids and other ingredients that will have no meaning to you. Just because a food product has a label doesn’t mean its substances are transparent. Some things remain hidden among weird names. For instance, one of the basic components of many cuisines in the world – bread – can sometimes contain an ingredient called L-cysteine. This doesn’t mean anything to you, does it? 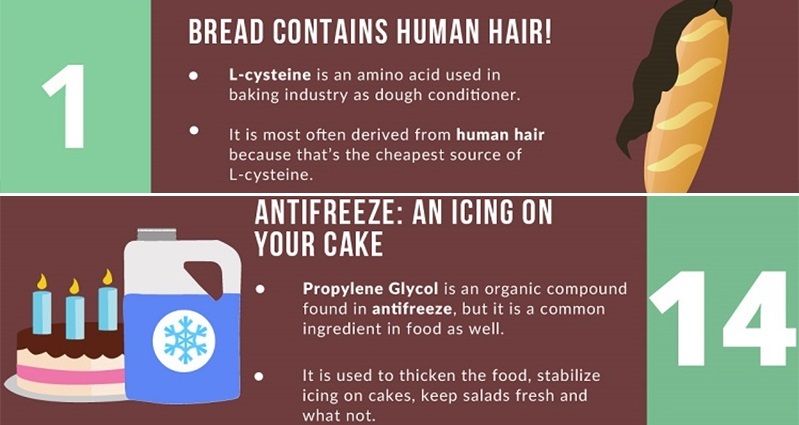 But did you know that this amino acid used in the baking industry as dough conditioner can be derived from human hair? I guess food scientists who are vegetarian don’t buy this kind of bread. 🙂 Another example is the Castoreum extract used as a food additive in ice-cream. This weird name ingredient has an even weirder origin. It comes from castor sacs of male and female beavers and it is approved by the FDA. However, the food industry can surprise us even further. Since food is produced on a mass scale today, the FDA establishes maximum levels of unavoidable defects in foods which, of course, don’t present health hazard. So, for example, an average of 1 rodent hair is allowed in 100 grams of peanut butter. It doesn’t mean you’ll find a rodent hair in your peanut butter jar, but do not be surprised if you do. To be sure that you are making the right choices when it comes to healthy food regimes, check this infographic on bizarre ingredients hidden in food labels. You will be amazed about what we are eating these days.